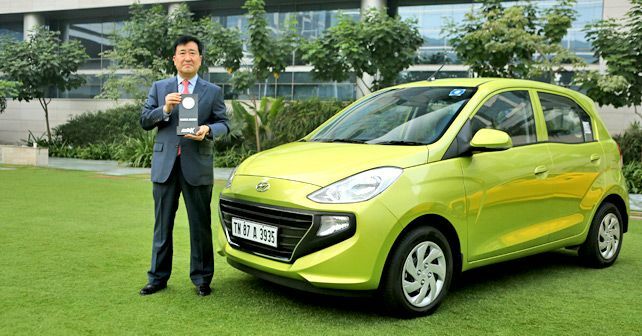 The Santro name essentially established the Hyundai brand in the country, and they sold over 1.3 million units in India – catapulting the Korean automaker to becoming the second largest car manufacturer in the country. Naturally, with the second-generation Santro, Hyundai is looking to build on that success – exactly 20 years after the company made its entry into India. The cabin is a demonstration of how well space can be managed in a small hatchback. As a result of its (still) tall boy design, there’s ample head and shoulder room in the Santro. The wide glasshouse also contributes to this, giving the interior an airy feel. There’s enough space to seat two six-feet tall adults back-to-back, which, for a car of this size, is excellent. Equipment wise too it’s class-leading. Not only do you get a 7-inch touchscreen multimedia system, with Android Auto and Apple CarPlay, as well as Bluetooth connectivity, but also a single airbag and ABS and EBD as standard. The Santro is also the first car to bring rear air conditioning vents to the compact hatchback segment. Another standout feature of the new Santro is its AMT gearbox, which by far the best AMT that we’ve ever tested. Overall, given the features and space it offers, along with the class-leading AMT option, the new Santro is an impressive product that scores well in terms of space, refinement, ride & handling and practicality. And, given its loyal following, there’s no denying that the new Santro will write a new chapter for Hyundai in the Indian market.